Many people who originally buy iPhone’s choose to stay with the iPhone because it’s where all their music is stored — with iTunes, playlists available directly from the device itself and the dedicated music docks only work with Apple devices. To change platforms isn’t realistic unless you want to change everything else around you. 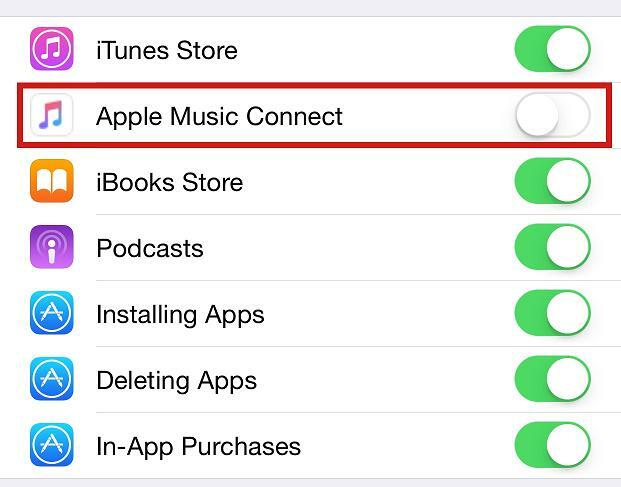 Apple Music Connect is Apple’s latest idea to try connecting the music fans among us. Since music plays a key role in keeping young people between ages 18-30 with Apple, it’s only fitting Apple do due diligence and try amplifying the music features as much as they can. As the age-old saying goes, you cannot keep everyone happy. 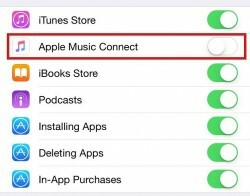 So, while it’s important to create new music features such as Apple Music Connect, it’s just as important to have a way to disable the feature for any people who don’t want it — and believe me, there are plenty. Whenever you have additional services or features from the UI, they come at a cost. It creates additional requests for your software which results in less performance, plus you’ll find battery life less efficient. Turn on the iPhone and open the Settings app. Point to General > Restrictions. Look for the Apple Music Connect icon (second from the top) and toggle it off. Once toggled off (left) the iOS software will remember your preference and you can tap your away back out of there and Apple Music Connect will be gone from the UI. I can tell you that running iOS 9 beta software as a developer doesn’t allow me to toggle this feature off from restrictions. It’s not known whether Apple is taking away the ability to toggle is off entirely (hello Cydia tweak), or if the feature isn’t included yet.